It's going to sound like a stereotype about Japan, but you have to admire the discipline and quality of this construction site. Yes, we recall the sad suicide from overtime work case from 2017, but in terms of safety precautions and order on the site, new national stadium in Tokyo may serve as an example. It's almost hard to remember all the serious issues this project faced from 2012 onwards. The selection of Zaha Hadid's design, then downscaling and eventually abandonment of that design in favour of the more constrained Kengo Kuma vision. It was a messy case back then, huge hole in the ground after former stadium even managed to get partly reclaimed by nature due to constant deadlock. 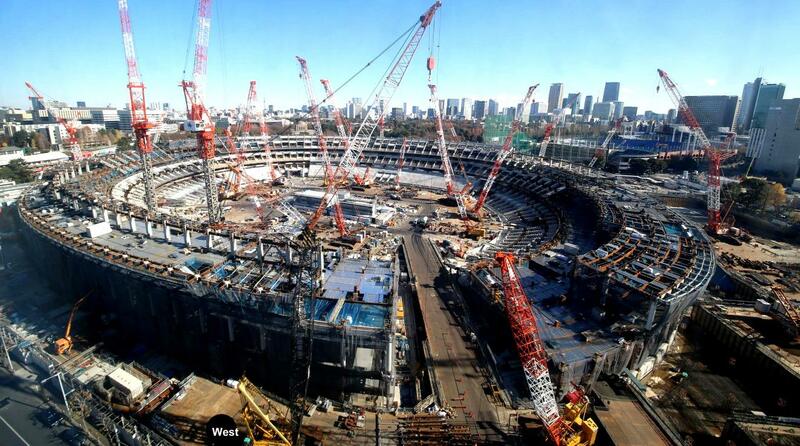 Of course the fast progress doesn't mean Tokyo is getting the Olympic Stadium ahead of schedule. It's an extremely complex project at the heart of Japan's capital and the most challenging parts are still ahead in order to deliver it by the end of November, 2019. Current employment on the site reaches 1,300 people but could grow to 2,500 or even 3,000 by the summer. Overall, the Japan Sport Council estimates that as many as 2 million (!) people may contribute to the stadium's delivery, be it on the site or at numerous prefabrication sites across the country. Perhaps the most exceptional phase will be the consturction of its roof. Total weight of the metal and wooden frame is expected to exceed 19,000 tons with all equipment in place. In order to deliver the entire roof in 14 months (by May next year) work requires great organisation. The structure is thus divided into 108 segments, each 15 meters wide and 60 meters long. With equipment every segment could weigh as much as 180 tons and a total of 14 can be assembled at one time due to lack of space. Then they're going to be lifted into place by crawler cranes able to carry 300 tons. The roof will reach almost 50 meters in height, however it's expected to drop by 50 cm when supports are removed, ending up at 47.4m. Interestingly, the traditional steel frame of the roof is being combined with wood, domestic cedar and larch being the choice. While preparations for the roof lifting is beginning, another phase is about to commence beneath the stands. From February onwards the stadium's vast floor space will see first furnishing works, expected to end in November, 2019. In April the very first exterior works are set to begin, as well as the key aesthetic feature of the stadium: pedestrian decks of the stadium. Each of them will end up being decorated with wood and actual shrubs and trees. That decorative effect shouldn't be expected sooner than late 2019, though. The new national Olympic stadium of Japan will end up with capacity of just over 68,000 people. 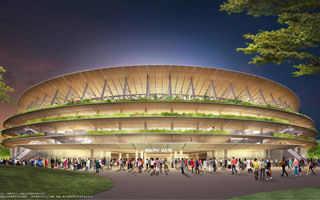 With budget of 149 billion yen (159 billion with associated costs), the building will become the most expensive stadium in Japan's history and one of the most expensive worldwide. It's opening is expected in early 2020, following two months of inspections and handover proceedings.